Despite a catastrophic explosion aboard the Airbus A380 he was in charge of at the time, in 2010 Australian pilot Captain Richard de Crespigny overcame impossible circumstances to bring the world’s largest passenger aircraft safely home with only one fully operational engine. From the clutches of disaster, the 469 souls on board somehow walked away unharmed. 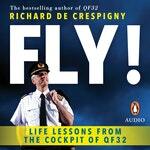 But far from any mid-air miracle, de Crespigny puts the outcome that day down to a combination of leadership, teamwork and skill. 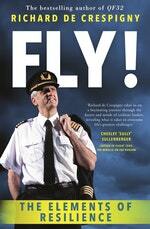 In Fly!, de Crespigny explores the lessons he’s learned in pressure-cooker cockpit situations to offer insights into dealing with the challenges and seizing the opportunities we encounter in our everyday lives. In the passage below he shares a Crisis Survival Checklist to turn to during moments of stress. At some stage, we all face crises of varying kinds. Even when the circumstances that have caused the crisis are out of your control, the actions you take can make a significant difference in how well you survive. Crises are becoming more frequent. In the past decade, the number of headlines featuring a Top 100 US company and the word ‘crisis’ is up 80 per cent on the decade before that. Whether the crisis is public or private, immediate or unfolding over months, there are strategies that will help you find your best options to deal with the situation. They will help you tap into your own resilience and strengthen your ability to deal with adversity. Deep in crisis mode, it’s easy to feel overwhelmed. It’s common to feel you have no options and no time. You actually have more of both than you realise. It’s just a matter of knowing how to create time and free up your mind. The QF32 crisis isn’t something I would have chosen to experience. I’d have been perfectly happy with a smooth, steady, predictable flight that day. But even so, I was sure that by calling upon decades of experience and the support of my teams on the aircraft and the teams supporting us on the ground, I would be able to come up with potential solutions. They mightn’t all work. Maybe none of them would, but I’d keep on trying things and never give up. You can’t control what life throws at you, but you can control how you respond. Millions of people around the world deal with crises every day. They might not be in the cockpit of an A380 but they are dealing with something that is pushing them to their limits, and finding a way through. Prepared and resilient, you can too. Create time if possible. Resist the panic response. Breathe, keep calm and free up mental space. Don’t waste energy pretending the crisis isn’t happening. Accept your reality, look ahead and fight the enemy in front. Even as a crisis is still unfolding, stop it getting worse by identifying threats and then avoiding, addressing or mitigating them. If you’re overwhelmed by what’s going wrong, turn the problem on its head. Go simple, be creative and work with what you have, not what you’ve lost. There is no ‘perfect’ plan. It’s true you shouldn’t leap in blindly, but nor should you stand back until it’s too late. You can never communicate enough. When you think you’ve communicated enough, double it. If you’re leading, deliver a NITS brief. S – clearly explain any special requirements. Preparing for ‘the unimaginable’ won’t stop it happening, but it will greatly increase your chances of surviving it. Spare time for those who care for you; they’re going through it too.